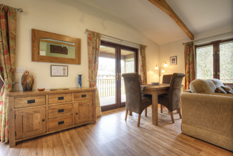 The living area of the lodge at Waldon Valley is all open plan. The kitchen, dining area and lounge area are designed so that everybody can chat whilst cooking, eating or relaxing on the sofa, in front of the wood burner. The large open plan kitchen area has ample space and utensils for the preparation of most dishes, with plenty of cupboard space to store all of the supplies you'll need for your stay. The kitchen is fitted out with a fridge/freezer, washing machine and dish washer. 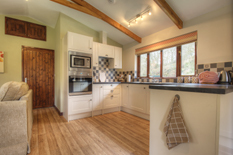 The lodge offers sleeping accommodation for up to four people - one twin bedroom, and one double bedroom. Both rooms are well lit and airy and provide the ideal environment for a good night's sleep. The bathroom is fitted with a basin, lavatory, bath and shower, ideal for cleaning yourself up after an afternoon spent walking in the countryside. A view from the lounge area of the lodge, showing the comfortable sofas and the eating area.